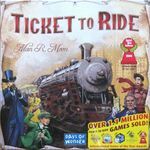 This is the 3rd English Language Edition of Ticket to Ride. The box art differs from the 2nd English Language Edition primarily because it has a area that says "over 1.1 million copies sold" and lists some of the international awards the game has won. Box shows 2010 copyright date.